Class starts each day at 8:00 am. A detailed description of this course is on the National Highway Institute website (www.nhi.fhwa.dot.gov). Some highlights from the NHI website are provided below. The course curriculum for this training reflects current practices, while addressing new and emerging technologies available to bridge inspectors. In addition, the course features exemplary training, hands-on workshops for popular types of nondestructive evaluation (NDE) equipment, and a case study of an inspection plan for a fracture critical bridge. The first day of the training focuses on the concept of fracture critical members (FCMs), FCM identification, failure mechanics, fatigue in metal, and an overview of NDE methods. Day two includes demonstration sessions and hands-on applications of NDE techniques for dye penetrant, magnetic particle testing, Eddy current testing, and ultrasonic testing. Days three and four emphasize inspection procedures and reporting for common FCMs, including problematic details, I-girders, floor beams, trusses, box girders, pin and hanger assemblies, arch ties, eyebars, and cross girders/pier caps. The course will conclude with a case study detailing the preparation of an inspection plan of a fracture critical bridge. Additionally, the course instructors will tailor discussions of topics based on State needs and requirements. “This training will help inspectors evaluate bridges more thoroughly and will provide them with additional knowledge in how structures work and what can take place when they don’t work,” states Bill Drosehn, district bridge inspection engineer for the Massachusetts DOT. Those who will benefit most from this training are public and private sector bridge inspectors, supervisors, project engineers, and others responsible for field inspection of fracture critical steel bridge members. Prior to taking this course, participants should have completed NHI course 130055, Safety Inspection of In-Service Bridges, or possess equivalent field experience relative to bridges. 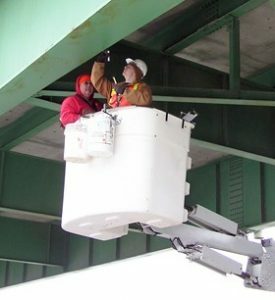 Participants also should have a thorough understanding of bridge mechanics and bridge safety inspection procedures as required by the National Bridge Inspection Standards. If you have questions or need more information please contact Paul Albritton at 515-294-1231, palbritt@iastate.edu.